No matter how long you’ve playing fantasy football there are always some lessons to learn. The game is evolving, and your fantasy strategies should follow suit. As we start our review of the 2018 season and begin to look ahead, it’s important to keep an open mind. A year after seeing its lowest offensive production in a decade, there were a record 1,286 offensive touchdowns in the NFL during this past season. Over the next few weeks I will offer some of the lessons I’ve learned or ones that I was reminded of in fantasy during the last campaign that could prove to be very insightful as we head toward 2019. We’ll start off by taking a look at the quarterback position. This shouldn’t be the first time you’ve heard or read this. But if there was ever a poster child of this theory look no further than the 2018 version of Aaron Rodgers. Drafted as a mid-third-round pick this past summer, the Packer finished as QB7. Meanwhile Patrick Mahomes, who had an ADP of QB15/10.08, went on to become one of the greatest value picks in the history of fantasy football as he scored more fantasy points (431.1) than any other quarterback ever. His 50 touchdown passes tied the mark for second-most in NFL history. As a whole, quarterbacks combined for 8,086 yards on the ground this past season, the most in league history. In addition, seven of the top eight finishers in fantasy points at the position rushed for at least two touchdowns. The number of mobile quarterbacks in the league is growing rapidly. 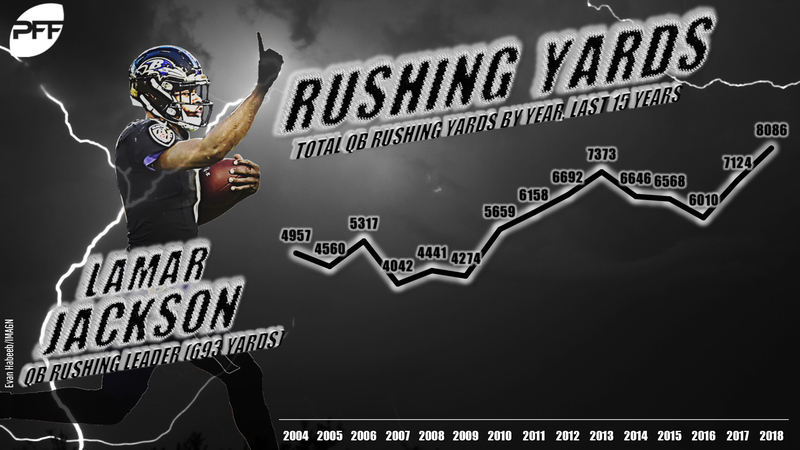 Typically, guys who rank among the league leaders at the position in rushing yards prove to also be fantasy assets. However, this year was the first time since 2010 that leading quarterback rusher failed to finish inside the top 10 in fantasy points for the season. Lamar Jackson led the league with 695 rushing yards but finished as QB29 because he only started seven games. Still, even though he didn’t take over under center until Week 11 Jackson set a new NFL record for rushing attempts (147) in a season by a quarterback. A handful of quarterbacks are good enough to overcome the lack of talent around them, but the vast majority of the league’s passers have their success directly tied to the environments they play in. Offensive lines definitely have a major impact. Protection is paramount for success at quarterback. It should come as no surprise that only one quarterback (Kirk Cousins) from the teams ranked in the bottom six of PFF’s final offensive line rankings finished inside the top 10 in fantasy points at the position. When you take a deep dive into PFF Premium Stats at how quarterbacks perform under pressure you’ll see that of the top 15 fantasy finishers at quarterback in 2018 all but Russell Wilson ranked in the top half of qualifying players at the position in the number of dropbacks when not under pressure. 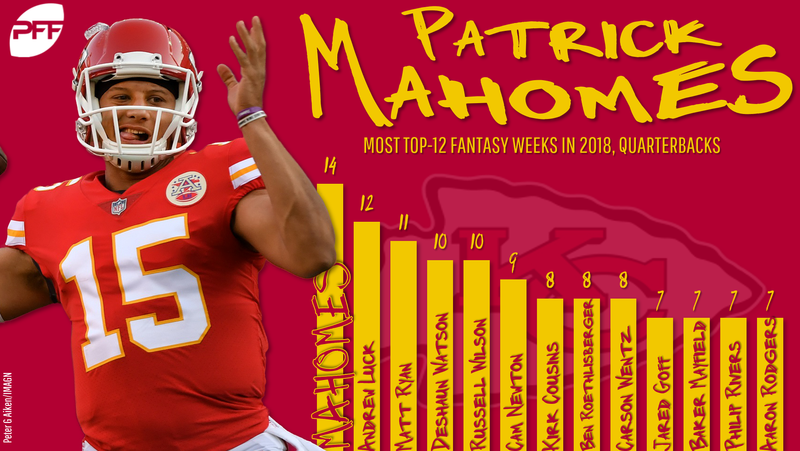 Mahomes took the league by storm in just his second pro season and first year as starter, finishing as the top fantasy producer. In total, six of the top 16 fantasy quarterbacks this season have been in the league three or fewer years, including rookie Baker Mayfield. Mayfield took off once Freddie Kitchens was promoted to offensive coordinator. During those eight games the Browns’ franchise player was the seventh-best fantasy quarterback. If you project those numbers out to 16 games, you’d be looking at over 4,500 passing yards, 38 passing touchdowns, and 324.4 fantasy points. In addition to Jackson and Mayfield several other rookie quarterbacks made their debuts in 2018, including Josh Allen, Sam Darnold, and Josh Rosen. Allen in particular was solid, boasting a six-game stretch to close out the year that was unmatched by any other QB as he averaged 25.4 fantasy points per contest. There were 39 quarterbacks to finish as a top 12 fantasy quarterback during a given week this season. Only six of those players did it in more than eight games – Mahomes (14), Andrew Luck (12), Matt Ryan (11), Deshaun Watson (10), Russell Wilson (10), and Cam Newton (9). When you take a deeper look at this, there are some things that catch your eye. Some people might not realize that for instance that Allen had as many top-12 weekly finishes (six) as Drew Brees and Tom Brady in 2018 or that Nick Mullens had the same number of top-12 outings (three) this year as Jimmy Garoppolo has had with the 49ers through the same number of starts. Bottom line, consistency was very hard to find at quarterback and every week seemingly always offered some surprise production. With most leagues only starting one quarterback, finding production on the waiver wire isn’t hard to do. This past season had more fantasy points scored at the position than any other season in the PFF era with 9,337.9 fantasy points scored by signal-callers. The 2018 season saw the second-most TD passes (834) thrown by quarterbacks in NFL history. Meanwhile, QBs accounted for 129,644 passing yards which the third-highest mark ever. Quarterbacks made fewer mistakes this past year as the number of interceptions (418) were the second-fewest since 1983. In 2016, there were only 415 passes picked off. Clearly there is a changing of the guard at quarterback and the new blood is working its way to the top of the pecking order and the old regime of Brady, Brees, Roethlisberger, and Philip Rivers appear to be passing the torch. The influx of young talent combined with the lengthy veteran production in recent years has left the position as deep as it has ever been in fantasy. Despite the temptation to go after one of the top quarterbacks on the list, you will be much better off stacking up on running backs and wide receivers and maybe even tight ends well before considering drafting a quarterback. This also might be a good time considering adding a superflex to your current league or at the very least expanding your fantasy portfolio to playing in a superflex league. It will go a long way toward making the quarterback position more relevant and important in fantasy football.